The preliminary phase of the design program at Bergin Golf Designs produces the Master Plan for the project. Whether for an original design or a major renovation, the final strategy of the golf course, the project’s scope of work, and a timeline are produced. Also presented in Phase One is the design cost analysis, which itemizes the budget and corresponding quantities. The budget is broken down not only by category, but also hole-by-hole, detailing every aspect of the design and related costs. Due to the attention put into the planning process, very accurate forecasts of the project’s final construction costs are attained. Once the final routing and strategy have been determined, a digital artistic rendering, like the one displayed to your left, will be produced. The rendering may be used for promotional purposes and permanently displayed in the clubhouse. 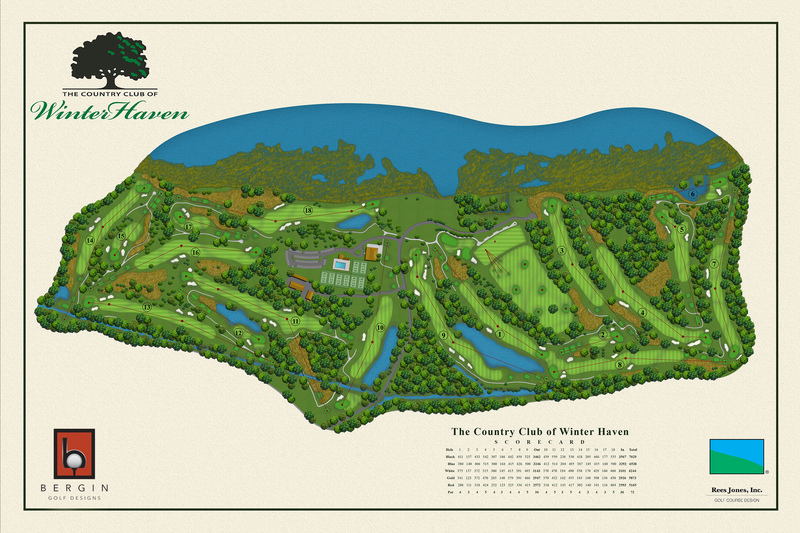 Click on the Country Club of Winter Haven rendering for a better view. Upon completion of all preliminary planning, Construction Drawings are prepared and include: the contour plans; the clearing plan; the cut & fill plan; the drainage plan; irrigation plans; the grassing plan; greens plans; and construction details. The products of Phase Two are the complete set of plans, the technical specifications detailing how the golf course will be constructed, and the bid for contract necessary for selection of the contractor. Bergin Golf Designs’ plans have been developed over the years to account for all aspects of a golf course construction project. Each plan has a detailed chart that coincides with our budgeting process. Contractors and Owners find that Bergin Golf Designs’ planning process is thorough, yet easy to understand and carry out. 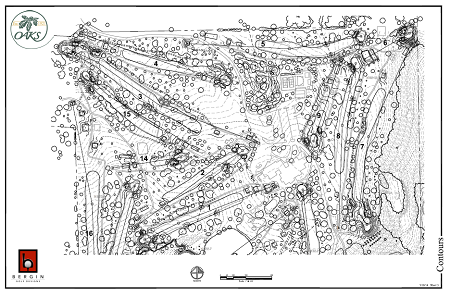 The Oaks Country Club Contour plan is an example of the detail that goes into each of our drawings. Click on the image for a closer view. Bergin Golf Designs will be the owner’s representative in dealing with the contractor, and will oversee all aspects of the construction process. While our plans are very specific, project layout and supervision are vital to ensure proper implementation. Site visits are scheduled weekly during the construction phase. Following each visit, specific levels of completion will be recorded in a formalized set of site visit notes outlining instructions for refining the work. Additionally, the budget will be updated with each application for payment, allowing immediate analysis as to the project’s progress and its relationship to the budget. 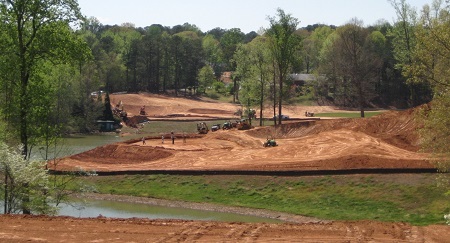 Pinetree Country Club’s 12th hole during construction. See this hole’s final product on the Transformations page. Bergin Golf Designs’ systematic budgeting process and plan documentation results in accurately forecasted costs for the project. Our detailed construction plans and corresponding budgeting system allow the contractor to implement our design in a timely and economical manner. As the owner’s representative, Bergin Golf Designs ensures that the project remains on budget throughout the construction process with thorough supervision and monthly budget updates. 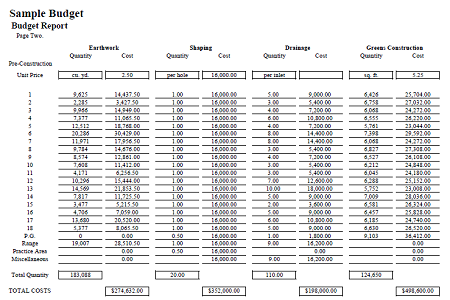 Shown here is a sample page from our eight page budgeting system, detailing the project for each line item and hole-by-hole.